Becoming a freelancer and working from home has many benefits, not least, the fact that you are your own boss. 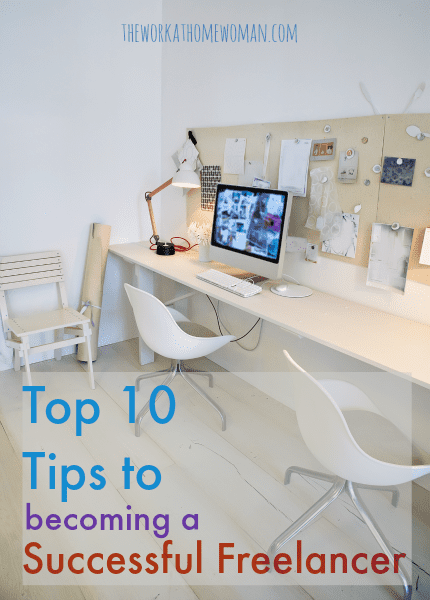 Setting your own working hours, your own rate of pay, and when you take your coffee breaks might sound easy, but in fact setting the basics in stone before you have actually begun working from home is the most important thing you can do from the beginning. 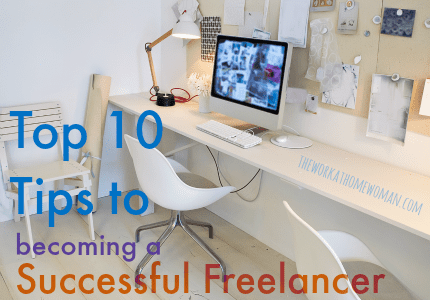 Here are my top 10 tips for becoming a successful freelancer. 1. Organize Your Own Dedicated Work Space. Your kitchen table is not a good place to work on a daily basis. Find somewhere quiet, free from distractions, where you can work in peace and quiet. This is one of the most important aspects of working from home — even though you aren't leaving your home to start the daily commute, you still “go to work.” A simple desk set up in the corner of a room, with all the tools you need, will suffice. It is your place of work and where you will start your amazing journey. Once you secure that first all important client, you want to be prepared for when you invoice them. Setting up your business bank account or PayPal account (other online payment merchants are of course available), means that at the end of the billing month you are ready to submit your invoice with your payment details. Have a draft invoice prepared with your business name on it, so that you don't waste valuable time later setting this up. You can even create an invoice using PayPal. Have in mind what you want to set as your hourly rate together with any additional charges that may be required. You want to sound professional and come across as confident when you get your first client. What equipment do you need to run your freelance business? Will a smartphone be enough to enable you to carry out your work, or should you invest in a PC or laptop? Will you need a printer to print off invoices or letters? Do some research to see what you may or may not need. When it comes to software, most of the standards have free alternatives available. If you don’t already have Word or Excel, you can use Google Drive. The good news about freelancing is many people are able to start with what they have and upgrade as the profits come in. Okay, so working from home has great benefits. You can make a cup of coffee when you like, go for a walk, do the ironing … This is exactly what you should not be doing! Set yourself a daily working plan. Set your start time, your coffee break time, your lunch time, and your quitting time and stick to it. Getting into the mindset of being at work and not at home is crucial and the key to your own success. Have you any expertise in a particular area? Carry out some research and find out who your target market is and concentrate your efforts on them. Don't cast your net too wide in an effort to find work, as casting too wide may mean missing out on that one person who could become your first client. Find forums and websites dedicated to your niche and perhaps start commenting there and becoming part of the community. Send out email pitches to those within your area of expertise offering your services. Don't overstretch what you are capable of doing and fall into the trap of saying yes to every new prospective client. If what they are asking you to do falls outside your particular area of expertise or interest, politely decline. 7. Turn Off Your Phone and Lock the Door. It is very easy for others to assume that because you are a freelancer and work from home that you are available for a chat or a cup of coffee, or to run errands. Make it clear to family and friends that you are working and work means work! If that means turning off your phone and locking your door, then do it. It may take a while, but they will soon get the message. Okay, I'll hold my hands up to this one – on occasion I've gone to work in my pajamas. However, if you get dressed in the morning, you will feel much more productive and ready for the day ahead. I always feel more professional and ready for action when I am suited and booted. 9. Schedule in Some “Me” Time. Starting up your own business as a freelancer can be daunting, and all too often you may be tempted to check your emails when you have finished work for the day, or even when you are away for the weekend. While it is important to keep in touch with clients, it is also vital that you have some time for yourself to unwind and relax. Giving yourself some well deserved down time will leave you feeling relaxed and ready for Monday morning all over again. Remember, becoming a freelancer and working from home can be so rewarding. You somehow work harder for any money you will earn, and you will take more enjoyment and pleasure working for yourself. Enjoy it, for this, is the start of something big. Do you have tips for becoming a successful freelancer? Drop us a note below, we'd love to hear from you! Angie Nelson has been a virtual assistant and serial blogger since 2007 when she took her future into her own hands and found a way to escape the corporate cubicle farm. Today she balances several successful online ventures and still manages to share her passion for making money with others on her blog The Work at Home Wife.com. Sign up here for her 7-day email series on finding work from home. I want to be a freelancer and I find this article very educative. I can’t wait to start on my new journey and thanks for the feed, it was really helpful. Glad you enjoyd the tips, William! Yes, I totally agree with what you said. I think that it is really important that when you work at home your time is just dedicated for work but also always find some time to unwind and get refreshed again. Thanks for sharing this article. Freelancing gives flexibility and freedom to choose our own time & hours for doing work. It’s a great way to supplement your income.freelancer can come with a lot of perks, you usually get to work from home, You can probably see where I am going with this. The freelance work/life balance can be very tricky to get right. which we know can lead to increased motivation and engagement. The freelancing economy is growing because nowadays everyone wants to become self-employed and wants to live their life independent without any managerial pressure with high income and top companies are also hiring freelancers so that their projects can be completed on time and help them to save their operating cost. Great tips Angie. I agree with all of them, especially about learning to say “no.” My one challenge is closing the door when my grandsons come over. I can’t say no to them when they’re knocking on the door, calling my name :). Thanks for sharing. Hope you’re having a great week so far. Oh, that would be tough! But that’s the beauty of working from home — you can flex your schedule to fit your life. Thanks for stopping by, Cori.